The Nova Scotia Council of Nursing Unions completed two days of discussion on Friday, June 15. The Council of Nursing met on June 14 and 15 to prepare bargaining proposals. 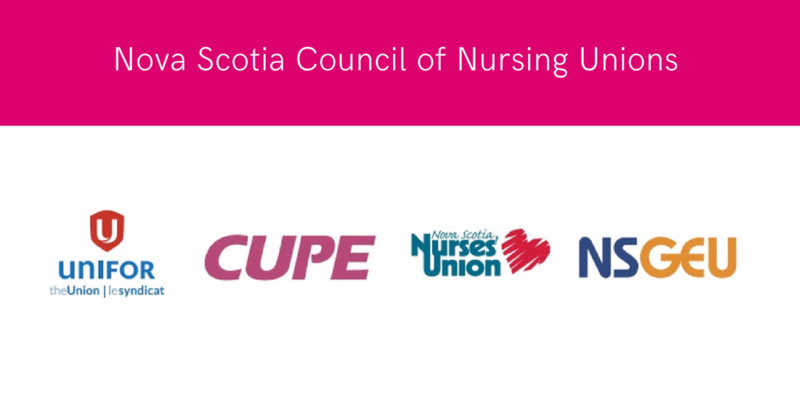 Over the course of the meetings, the 26-member council discussed bargaining priorities and collective agreements from all four unions (NSGEU, CUPE, Unifor and NSNU) in acute care. The team will have to review contract language for all nurses, in all categories, to reach consensus on what to preserve, what to expand upon and what compromises may be required. These inaugural meetings were very productive, but additional dates are required this summer in order to be fully prepared before exchanging proposals with the Nova Scotia Health Authority (NSHA) and IWK on September 5. The Nursing Council will meet again on July 3 – 4 and August 22 – 23. The nursing unions have, over the last year or so, been surveying and talking to members about bargaining priorities and the new realities of negotiations in Nova Scotia. The Nursing Council met on previous occasions for preliminary introductions and instruction when the full Nova Scotia Council of Health Care Unions has convened. The parties have since agreed to send nursing to the table last as there are unique nursing-related issues to be dealt with in bargaining and potentially in mediation-arbitration. In mid-May of this year, health care workers in acute care voted to accept an agreement with the NSHA and IWK that would allow any issues that cannot be resolved at the negotiating table to be sent to the independent, third-party mediator-arbitrator (William Kaplan) for a final and binding award. Kaplan has set aside November 19-23 for nursing bargaining unit mediation-arbitration. The employer and the Council of Unions accepted these dates. The agreement provides wage increases over a six-year term (2014-2020), including retroactive pay, protects key benefits and provides a mediation-arbitration process that will conclude all collective agreements for the four bargaining units in nursing, health care, support services, and administrative professionals by the end of 2018. Also under this agreement, the parties agree to waive all rights to strike and lockout under the Trade Union Act and agree that no essential services agreement applications will be filed with the Nova Scotia Labour Board while mediation-arbitration is pending unless mutually agreed otherwise by the parties. In the meantime, the Council of Nursing Unions is working hard to ensure that your best interests are represented. The team thanks you for your continued support of its members across the province and commits to keeping you informed as bargaining progresses through regular updates using a variety of communications tools at the disposal and discretion of the nursing unions. Aside from six staff representatives, the Council of Nursing Unions bargaining committee is comprised of 11 members from NSNU, seven NSGEU, one from CUPE, and one from Unifor. Please forward any questions via your Area VP. Contact information is available on the website at 8920.cupe.ca/about-us/your-executive. Download a copy of this member update.